We love our play dates and I really enjoy hosting a good few hours packed full of themed activities, food and play. So far we've only had my nephew and nice for one, but I am thinking of inviting a few of T's friends to one soon. I like to have lots of things for the children to do and if they get bored they can just play! I didn't make any themed food for this play date, we just had an indoor picnic. I split the play dough between the 3 of them and added some loose parts. I don't have any photo's of the little ones doing this craft because we were all fully engrossed! We squeezed the loo rolls into heart shapes and dipped them in red, silver and white paint. I'd already written their names on their card, once they had finished we stuck the pictures on the door to dry. J particularly liked this activity. After the painting we got out the valentines play dough, there looks a huge amount, because I made enough for M & J to take home. The recipe I follow can be found here, I just added red food colouring and red glitter. For our valentines day cards, I cut out heart shapes from red cards, I actually used my cuttlebug to cut these, but you could do this by hand. I then stuck some contact paper on the back so that the outside was sticky. To prepare for this activity, I pre-wrote the cards and also cut out heart shapes from the contact paper backing and stuck to the front to protect the 'stick'! I set-up the activity in a recycled sweet pot. Our little crafters pulled off the backing paper and stuck sequins on, M (girl aged 3 1/2 at the time) spent lots of time placing these on neatly, whereas the boys (My T aged 2 & J aged 3 1/2 at time) just grabbed handfuls, both methods worked well! After a film and a little rest, the children played with T's toys and had a bit of free play, I think that as well as some structured time, it is important for them to have a little time to do what they like. The sensory table was set up the whole day and the children kept going back to it all day, in the end, we had no specific sensory play time because it was there all day. 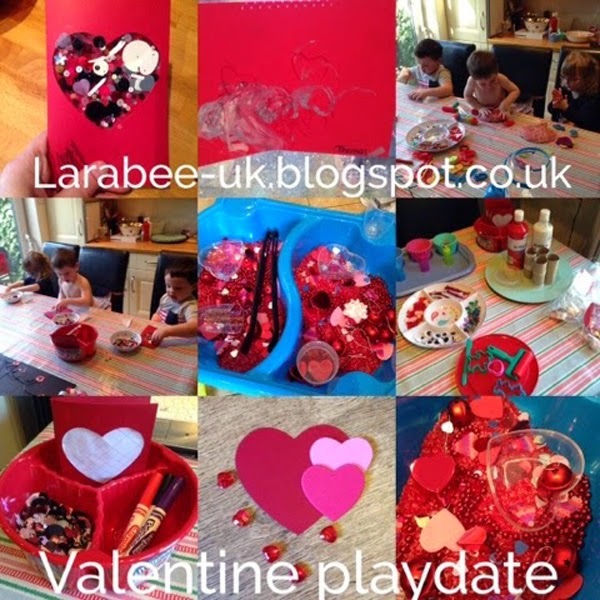 I hope you've liked our valentines themed play date.